Here’s my take on Hot Chipotle Salsa Recipe. I think you’ll love it. I absolutely love a good salsa. 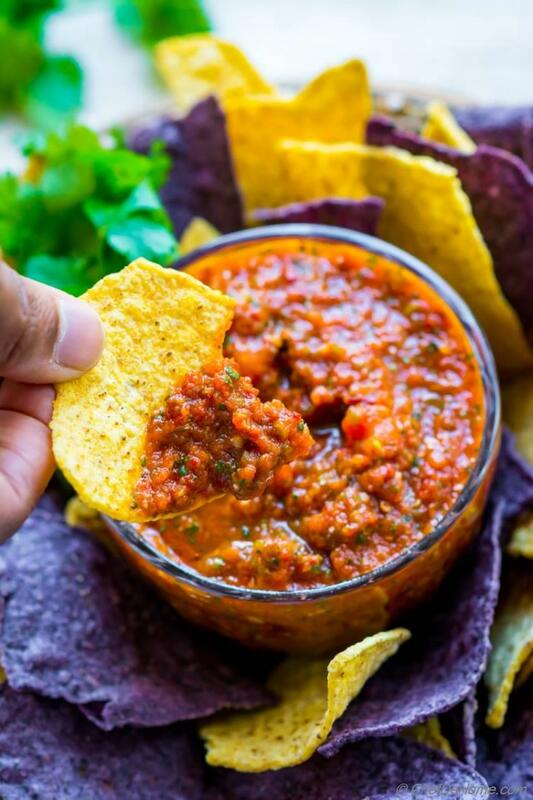 I'm more of a spicy hot salsa kinda girl and lately I have been loving this chipotle salsa recipe. It's the one I made with some leftover chipotle pepper and since then fell in love with hot kick of this salsa. 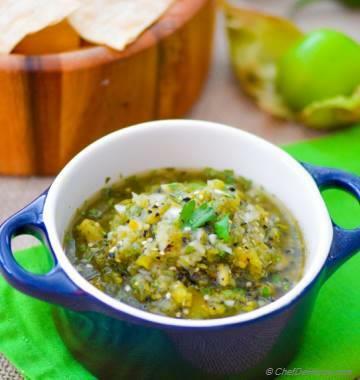 I find this salsa great for entertaining, really a perfect crowd-pleaser. Anyone who loves spicy-smokey dips and chips falls in LOVE with it. From my past experience, I can already tell you.. You will get SO many requests for recipe and will see empty bowl very quickly. :) Be Ready! Oh, and good news! It is a blender salsa! No need to chop a thing! 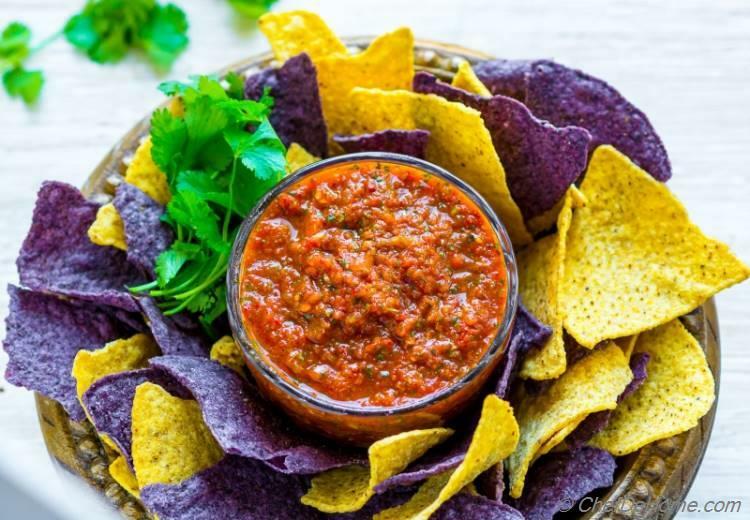 Just grab a blender and welcome guests with scrumptious bowl of Spicyyy Salsa and Chips! You guys! We are going Mexican this week! With labor day long weekend approaching, I'm giving you some great options to include in Labor Day Menu!! Starting today with this hot salsa. 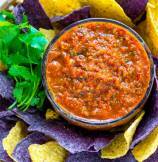 Oh, and this salsa is very close to Chipotle Mexican Grill's Red Salsa recipe! Honestly, I should say, it is even better and fresh tasting than Chipotle's Red salsa. For this reason, I decided to not call it a Copycat. To prepare my Chipotle Salsa, all you need is simple pantry ingredients and a blender. Ready in just 15-20 minutes.. 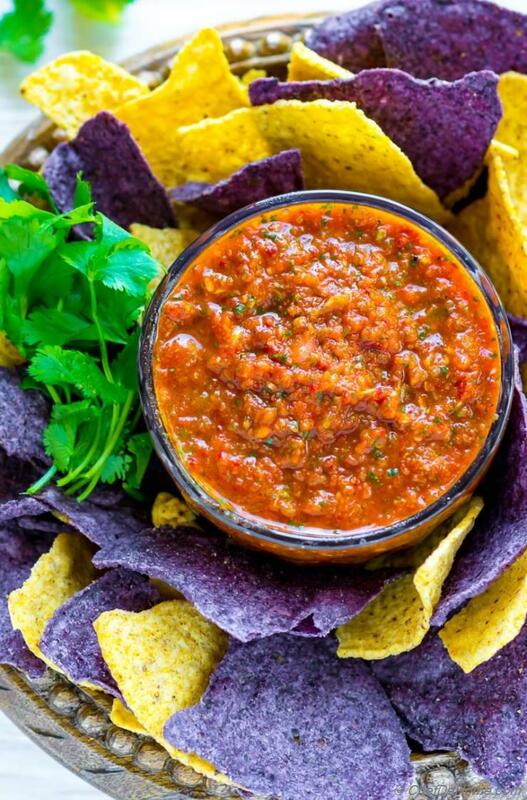 This salsa will be your favorite hot salsa ever! Better than Chipotle's, Guaranteed! First step in making this salsa is - roasting the jalapeno and garlic. Even though it is a Chipotle Salsa, I wanted to enhance the hot smokey taste with fresh roasted and smokey flavors. I highly recommend roasting a jalapeno and charring some garlic for this recipe. Once jalapeno and garlic are ready, next step is 5 minutes. Grab a good quality blender, add all ingredients and blend until salsa is ready. I like to keep it a little chunky for some bite.. but even a more purred version like restaurant's taste scrumptious! As they say, "there is always room for one more salsa!" Include this in your Party-Menu and it's flavors will be highly in demand. It will not be just one-more-salsa but "The Salsa and Chips" of the evening! Total Time 15 minutes Prep Time 10 minutes Cook Time 5 minutes Difficulty Easy Yields 3 Cups Salsa Serves 6 Notes No. of servings depends on serving size. Smart Swap Recipe doubles easily! Make a bigger Batch! 1. Roast jalapeno and garlic on grill in a grill pan, or broil, or toast in a dry heated pan until skin is charred and blistered mostly. Let these cool. Now, scrape of skin from jalapeno and remove seeds. Peel of skin of garlic. 2. In blender, add roasted jalapeno, and garlic plus all of the above ingredients. Pulse to make chuncky salsa. Taste and adjust salt and lemon juice. 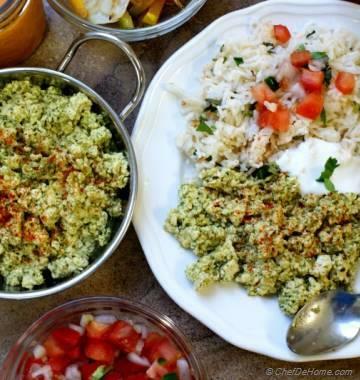 Serve with bowl of chips and enjoy! 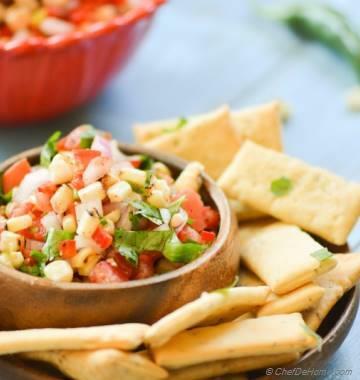 I also love a good salsa and this recipe is right up my alley! Love the simplicity of it so I will give this a try. Thanks for sharing. Karl, thanks for sweet words. Isn't it such simple salsa? I hope you get chance to try it soon! Thanks!